CINCINNATI — Kroger Co. said Wednesday that it is introducing a mobile payment solution that securely combines a customer’s payment and loyalty card information. Called Kroger Pay, the feature promises to deliver a faster checkout experience. The company is also launching a new Kroger Rewards debit card. Kroger Pay is billed as a quick, safe and easy-to-use feature within Kroger’s suite of apps, which are available for iOS and Android devices. 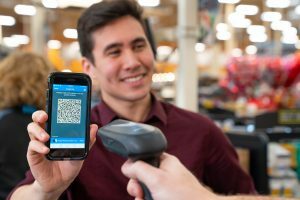 After a customer enters a custom PIN or biometrics, the app provides a single-use QR code that can be scanned at the checkout terminal to quickly communicate payment and loyalty card information, including digital coupons and personalized offers. The company said the single-step solution reduces checkout time and creates a more frictionless experience for both store associates and customers. Kroger Pay can be used at both traditional checkout lanes and self-checkout stations. Kroger Pay also rewards customers who use one of Kroger’s rewards cards — the 1-2-3 Rewards credit card, the Rewards prepaid debit card and the newly-released Kroger Rewards debit card — allowing customers to earn fuel points and grocery rewards with a single scan. Kroger Pay can also be linked to any major debit, credit or prepaid card. Kroger Pay recently launched in the retailer’s Columbus, Ohio division. The service will roll out to 10 additional markets in the spring, with plans to go nationwide later this year. Kroger Rewards debit card offers a payment option that connects directly to a customer’s checking account. The Kroger Rewards debit card offers benefits to customers, including bonus fuel points and Our Brands discounts, and the rewards double when the card is used through Kroger Pay. The Kroger Rewards debit card is currently available for use in Kroger stores in Columbus, Ohio and in King Soopers and City Market stores in Colorado. The payment option will roll out to all Kroger stores this spring, the company said.